World Records | Transport Western Australia at Gould Transport Kalgoorlie, Transport for the Mining Industry in Western Australia. 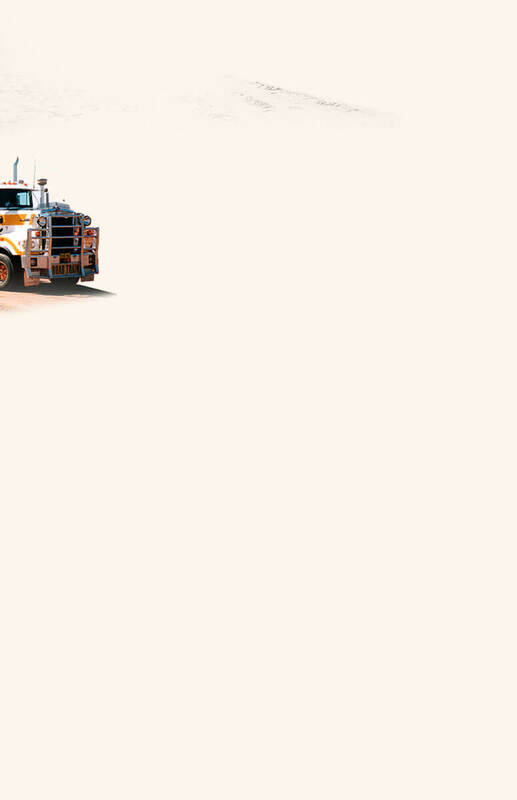 Road Train Transport Services, Ore, Nickel, Mime or Aggregate Transport Service throughout Western Australia by Gould Transport Pty Ltd, Located in the Goldfields Region of Kalgoorlie, Western Australia. Two days prior to the official “Tug Off” those involved were a buzz. People from everywhere were rallying together with what ever they could provide, from 1.4 kilometres of air hose, 7000 cable ties, 2000 hose clamps to 150 Eggs, 1 dozen loaves of bread and 20kg of sausages, everything and everyone was at hand. The before mentioned items are only a small part of what was donated, the biggest donations of all came from those companies that provided the trucks and equipment that were taken off the road for a period of two days at a cost to their businesses. This, and the drivers and volunteers that gave their all were not paid for their time, is the spirit which turned the attempt into such a huge success. It would not have mattered to anyone involved if the truck had not moved, they broke all records by becoming one in achieving their goals. The final preparations then began on Monday morning with a last ring around to confirm the supply of trailers and other equipment necessary to complete the task at hand. Trucks began to return home to their Kalgoorlie bases from various locations throughout Western Australia, some as far North as Karratha. Ten Compressors, Air hoses, fittings, cable ties and the like, signs and banners to be hung on trailers as representation of the various businesses involved in sponsorship began to arrive, the reality of what had taken months to organise had finally hit home. The time had arrived and the actual attempt was only days away, there was no backing out now. On the Wednesday morning after completing nightshift, the main truck (KNL), which was to lead the pull, arrived in the Gould Transport Yard. Special attention was given to every minor detail of the truck to make sure it was able to deliver the goods when required. A group of dedicated people washed and polished every inch of exposed metal and chrome and at the end of the day it was well worth it, a credit to those who put in the hard yakka. Also on that day, the day before the great attempt, the trucks were all being rigorously checked. This involved running them over pits and having several devoted mechanics scrutinise every last detail, checking for air leaks, making sure that all breaks were in good working order, that fittings and couplings were correct and that all trucks were safe and fully operational. This took approximately 18 hours to do. After they left the pits the trucks and trailers were washed, polished and run over the registered weigh bridge at Paddington. The weighing was witnessed by Mr Ron Van Dyk, an official representative of the Main Roads Department, this was also a very timely task as all weights had to be spot on to comply with “Guinness Requirements”. Signs were hung on trailers and compressors put in place. The next step required that all trucks be driven from Paddington to a private haul road, this was done by one truck towing four trailers at a time. They were then placed in a predetermined order ready to be put into position the following morning. These preparations delved well into Wednesday night the eve of the attempt. It had been a long day, many started at 4am and didn’t finish until approximately 11pm. Bright and early the next morning an entourage of bodies adorned in orange vests took to the Menzies Highway as the sun slowly rose over the Eastern horizon. They were on a mission and nothing could stand in their way. The task-to hook up 79 trailers at a total length of 1018 metres (this official length was recorded by main roads surveyors Bernie Millar and Ross Evans) and weighing in at 1072.3 tonne before the official “Tug Off Time” set for 9am. The way this was achieved was by careful consideration and months of planning. The trailer lots that were once groups of four had now become groups of eight. As time was of the essence it was necessary to close the southbound lane while this massive Road train was being formed. At around 7.30am KNL pulled out onto the Menzies Highway towing 12 trailers, it proceeded to the official starting line, which had been marked previously by main roads. This was only the beginning. What followed was a continual stream of block trucks towing the trailer groups of eight to the area of hook up, approximately 3km from where they had been parked the night before. Then using a loader fitted with an outrigger, which is used as a guide, and another truck to push the trailers up from the rear they were assembled. Whilst this was taking place another group of volunteers were busy attaching auxiliary hoses, which needed to run the full length of the truck and trailers. These hoses were then connected to compressors, which were allocated in approximately every eighth trailer, the compressors supplied air to make the brakes fully operational, if they were required. However the brakes were never used and the truck basically rolled to a standstill on completion of the 8.127 kilometres, the total distance travelled. As the hours passed and the rear of the caterpillar of trailers began to disappear out of sight, the crowd grew (approx. 5000 people were in attendance) and the atmosphere increased in anticipation of what they were about to witness. Finally the last of six block trucks used in towing the trailers into position went past, and the entourage of orange vests began to assemble at the starting line. All that was left to do, after several inspections, was the last and final check. “It took a while to come to the decision to let go but finally we figured that it was now or never. After months of living it and breathing it we suddenly realised what a mammoth task we had set ourselves-it was huge,” said Graeme ‘Techno Tug’ Terry, one of three fitters and a main player in the Doug’s Tug Team. Steve “Stag” Mathews had taken his place behind the wheel accompanied by Gary Penn who, with a grin from ear to ear, was like a child let loose in a candy store. The time had come a little over due, but no one cared for what they were about to witness will be a permanent fixture in their memories for years and years to come.